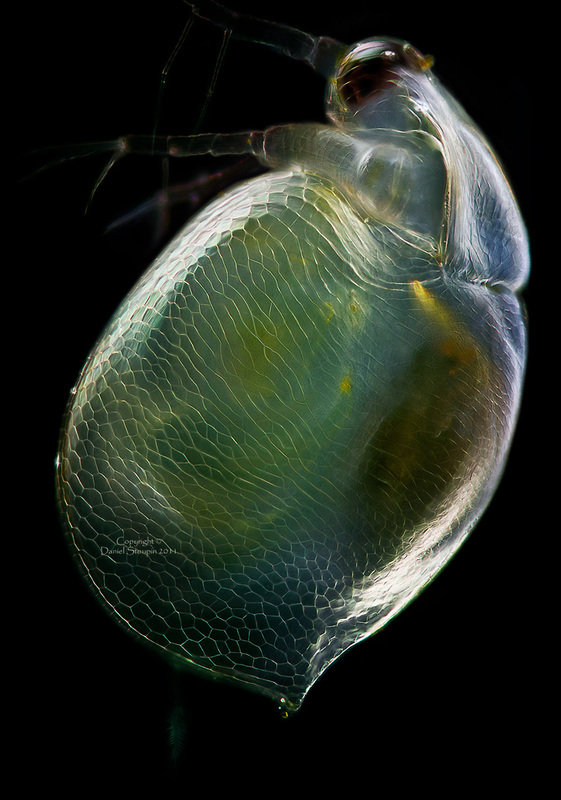 Water Fleas are over 600 species of teeny-weeny, itsy-bitsy crustaceans in the order Cladocera. They can be found in great abundance in just about every single lake, river or pond in the world, either swimming freely or attached to a surface. 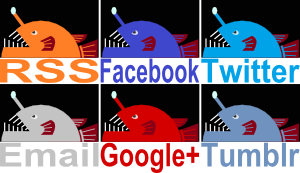 Some can tolerate the saltiness of brackish water and there are also a few marine species. They look remarkably rotund and not much else. It's like those aliens who have devoted themselves to the intellect to such an extent that their bodies have withered away, and now they're just massive brains that float around in anti-gravity gizmos and jet powered do-dads. Water Fleas appear to be more concerned with food than all that "thinking" stuff. After all, thinking has been out of style for like 50 years, eating is the new fashionable pastime these days. I know I wouldn't be seen dead as a disembodied brain! And it's even more unlikely I'd be seen alive as one. For this reason, Water Fleas don't have jet packs. They must instead make do with a huge pair of feathery antennae that are used to swim in a jittery, jumpy manner, like an excited corgi. Or those things you get on corgis... fleas. Only in water. They don't drink blood, though - most Water Fleas aren't so picky. They'll eat any kind of detritus or tiny algae they can find. 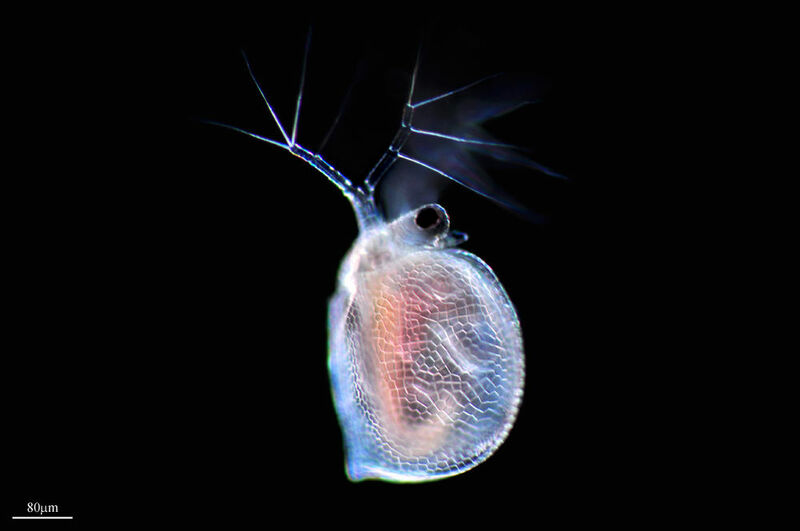 Along with the big, swimming antennae are another pair of tiny antennae to sense their surroundings, plus one compound eye. Everything else is usually encased in a shell called the carapace. Some of the 4 or 5 pairs of legs beat to create a tiny current that gets food in there, while the other legs act as filters to ensure nothing too big gets though. 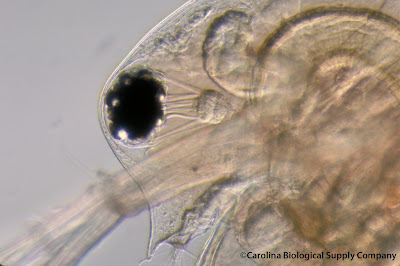 Some Water Fleas are carnivorous, eating creatures even tinier than themselves. This may include other Water Fleas. 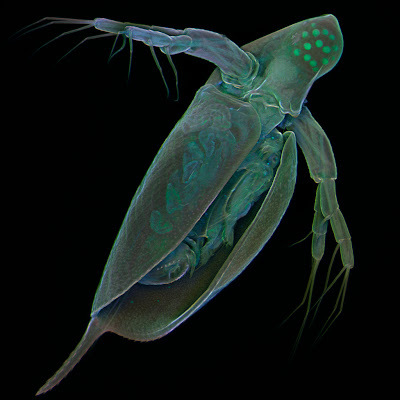 Unfortunate then that the biggest Water Flea of all is a voracious predator who dominates her tiny world with the kind of physical power that can only come from being over 2 cm (0.8 in) long. 2! Centimetres! Most only reach somewhere between 0.02 and 0.6 cm (0.008–0.24 in) in length, so the Giant Water Flea is actually 100 times bigger than some of the really tiny ones! So transparent you can see not just the eye, but the eye muscles! You'd have a hard time spotting even the biggest of Water Fleas, though. They are remarkably transparent. You can see right through the carapace to the body and legs within. You can see their food, their beating heart and even their circulating blood. You can also make them drunk with a drop of alcohol, although an entire drop would probably be far too much. The way they swim looks pretty inebriated already, but it has clearly visible effects on the heart rate so there's a lot of interesting meddling to be done. Something else you often see within that carapace are eggs. 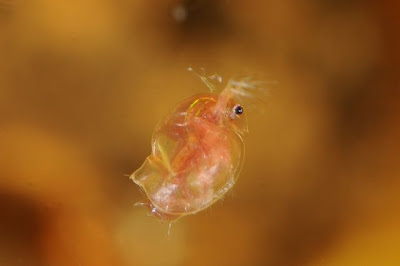 Almost all Water Fleas hatch as even tinier versions of the adults, without having to go through a larval stage. When the going's good, females can produce eggs through parthenogenesis, or virgin birth, where no males are required at all. This is good, since no males will exist at this point. Speaking as a male, this is difficult. To not exist in the first place is in one sense a blessing compared to being eaten or otherwise dying once you've fulfilled your purpose. But... it'd be nice to have a chance, you know? I guess it's not so bad. When conditions begin to falter and it starts getting hot or it starts getting cold or the place is generally not as nice as it used to be, the females will start to produce male eggs. Males emerge into a Brave New World collapsing beneath the indomitable power of the real world. It's full of female clones with whom the males must mate before planet Earth meets its seasonal demise, becoming a barren wasteland in which no hint of life can withstand the torture of the sun/the pond dries up. 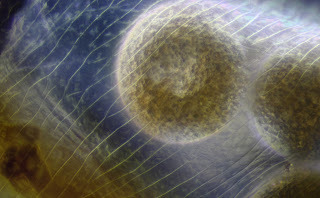 Females again produce eggs, but this time they're covered in a shell that allows them to survive until liveable conditions return. 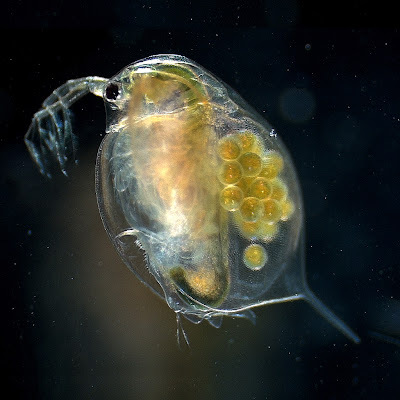 Some Water Fleas can use this to survive in deserts! The most extreme ones live in salt pans, where old lakes have dried up in desert heat to leave behind an expanse of salt and other minerals. Somewhere in the glistening aridity are Water Flea eggs, waiting to hatch when the next rains come. So it's a Flying Belly Monster. But it's an armoured belly. Coupled with their cloning programme, survival pods and ruthless, female-dominated caste system in which males are created only when required, and one can't help but think that the Brain Aliens have a serious competitor. Amazing! 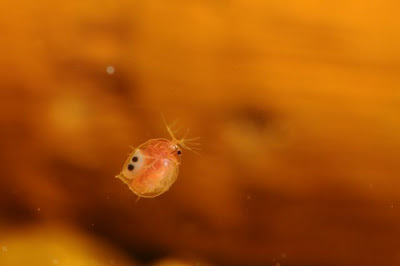 Such a tiny creature but so complex! I'm amazed to read that they can even survive in a desert! I know! Most bellies would have a tough time surviving in a desert! They look kind of like larval seahorses in transparent eggs. So weird! Haha! Yeh! Now that's REALLY tiny! So pretty! What the mosquito larvae see every day, but we miss. It's a whole other world!